1 What did William Branham teach? 2 What does the Bible say? 2.2.1 What does fulfill mean? 2.3 What does Paul say about the Law? 3 So we don't have to pay attention to the law anymore? 4 Can we mix law and grace? 5 So how are Christians supposed to behave? 6 Is this relevant in any other way to William Branham's ministry? What did William Branham teach? God ever says anything, He can never change it. He always magnifies it, not change it. The law was magnified, not changed. Magnified! "'Whosoever commits adultery shall be guilty of death,' but whosoever," now magnified, "looketh upon a woman to lust after her!" He never changed the commandment. He magnified it. William Branham used this concept of the magnification of the law, among other things, to bring Old Testament law into the church. But the question is - Does the Bible support this? Jesus NEVER states that he came to magnify the law. The LORD is a God who is eager to save, so he exalted his laws and teachings, and he wanted his people to honour them. But now his people have been plundered; they are locked up in dungeons and hidden away in prisons. They were robbed and plundered, with no one to come to their rescue. It is obvious from these translations, that this passage has nothing to do with the coming of the Messiah. There is no prophesied magnification of the law. However, in William Branham's mind and in that of most message believers it means to make larger and, therefore, harder to meet. Does it mean to magnify? What does this mean? What is the handwriting of requirements that Paul is talking about? He is talking about the law. Jesus came to fulfill all of the requirements of the law on our behalf so that the way to God is now opened! God sending his own Son in the likeness of sinful flesh, and for sin, condemned sin in the flesh: That the righteousness of the law might be fulfilled in us, who walk not after the flesh, but after the Spirit. (Ro 8:3–5). What does Paul say about the Law? Jesus did not sweep the the law under the carpet. He did not do away with it. He came and fulfilled every requirement of the law perfectly on our behalf. So by Jesus, the law has been fulfilled. Christ redeemed us from the curse of the law (and not from the curse of sin) because where there is no law there is no sin. Even the ten commandments are referred to as producing death. Paul called the ten commandments the ministry that produced death. Did you know that the ten commandments were received by Israel on the day of Pentecost. It was forty days after the Jewish passover when Moses went up on Mt. Sinai and received the Law. On that day they received the Law, three thousand people died (Ex 32:28). But what happened on the day that the church was born, the day of Penecost? Three thousand people came to life (Acts 2:41). The law produced death in 3,000 people on its first day, grace produced life in 3,000 people on the day the church was born! So we don't have to pay attention to the law anymore? Did Jesus go to Calvary and die to bring back the law to its pristine standard, a standard that ensured that no man could keep the law? If he was wanting you to obey what He said here, churches would be filled with blind amputees! The reason for His unbelievably high standard is to drive home the point that man cannot depend on himself... he cannot meet the standard of the law. He desperately needs a savior. If you try to keep the law you will fail. So why then does William Branham's message bring with it a set of rules and regulations that we are required to keep? Do you know that the apostles specifically talked about the laws that us Gentiles were required to keep? So what gives William Branham the right to change the requirements laid down by the Apostles? Can we mix law and grace? The law demands perfection but does not lift a finger to help. Grace on the other hand imparts perfection and does everything for man through Jesus Christ. If you try to mix grace and the law as the Galatian church did, Paul said that you have fallen away from grace. 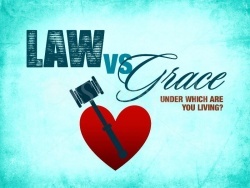 Paul said you are either entirely under the law or you are under grace. They can't be mixed. So how are Christians supposed to behave? ...serve one another humbly in love. For the entire law is fulfilled in keeping this one command: “Love your neighbor as yourself. (Ga 5:13–14). Do you know that Jesus never called sinners - not even the prostitutes and corrupt tax collectors - "a brood of vipers". Not once! Those harsh words Jesus reserved for the religious people, Pharisees, whose fixation on the law blinded them from seeing God in the flesh. Is this relevant in any other way to William Branham's ministry? We receive a question which asked: So, if the law is indeed magnified, would it not be logical to also assume the part of the prophets being done away with is not the case, that instead, the role of the prophet might be magnified as well? This question appears to be based on an incorrect understanding of the Biblical teachings of the law in the New Testament. We are no longer under the law but under grace. “I tell you the truth, among those born of women, no one has arisen greater than John the Baptist. Yet the one who is least in the kingdom of heaven is greater than he is." (Mt 11:11). The least in the kingdom of heaven is greater than John the Baptist. Why? Because every true Christian has the anointing of the Holy Spirit, which is greater than the spirit of Elijah! Why would we need the spirit of Elijah when each believer possesses something greater? It is sad that Christians sometimes fail to recognize what they really possess. What New Testament scriptures support the need for an Old Testament prophet, particularly one that seeks to lay requirements from the law on the church? There don't appear to be any. Based on William Branham's criteria, what does the occurrence of a single failure of a vision like the Municipal Bridge Prophecy require us to do with his prophetic ministry? He said, "If you come back at all, God hasn't spoke to me." Uh-huh? See? There was a prophet, there was a sign; there was His voice. And, to fail to obey it, brought judgment. The Holy Ghost is our prophet today. Fail to hear His Voice? He's identified in the Scripture, that He would say these things. Jesus Christ, the form of the Holy Ghost! They might say, "Well, I do this. I dance in the spirit. I, I speak in tongues. I, I prophesy. I preach the Gospel." But fail to let your hair grow out, fail on one thing, and see what happens, the Spirit will leave you right there. That's what's happened to our churches, failed. 248 "In vain, worshiping Me. Oh, it's a beautiful worship. But in vain do they worship Me, teaching for doctrine the commandments of man." If you fail, come back to this tape again. I don't know how much longer I'll be with you. Remember, this is the Truth, of THUS SAITH THE LORD. It's the Truth. It's the Scripture. ↑ The Holy Bible: King James Version, Electronic Edition of the 1900 Authorized Version. (Bellingham, WA: Logos Research Systems, Inc., 2009), Is 42:21–22. ↑ Joseph Blenkinsopp, Isaiah 40–55: A New Translation with Introduction and Commentary, vol. 19A, Anchor Yale Bible (New Haven; London: Yale University Press, 2008), 216. ↑ The Holy Bible: English Standard Version (Wheaton: Standard Bible Society, 2001), Is 42:21–22. ↑ American Bible Society, The Holy Bible: The Good News Translation, 2nd ed. (New York: American Bible Society, 1992), Is 42:21–22. This page was last edited on 29 October 2017, at 13:30.